FIVE like-minded Mid Wales livestock farmers have come together to market their own branded beef direct to high end restaurants and hotels. With the backing of the Prince Charles-inspired Cambrian Mountains Initiative, Cambrian Mountains Beef is looking to develop a significant market for cattle finished on the upland pastures of the picturesque mountain range which covers around 10 per cent of Wales and one of the most sparsely populated areas in England and Wales. Still in its infancy the group has established a high profile website and following visits to London with free tasting samples interest is said to be positive. Plans are also in the making to invite chefs from leading establishments across to country not only to experience the charms of the Welsh heartlands but also taste the beef from home bred cattle born and bred within the Cambrian Mountains. Orders have already been secured for one animal per week which will be supplied in turn by one of the group members set to benefit by way of a premium return set at 40p per kg above the GB 4L price for the week. A 5p per kg levy is being deducted to sustain the group and the individual producer stands the slaughtering costs of around £30. Specification for stock has been set for finished cattle within the weight range of 290 and 400 kg, with carcases of E to O+ and conformation between 3L and 4H fat class. The beef is being slaughtered at a fully assured abattoir no more than 15 miles from group members, matured for up to 30 days to ensure maximum eating quality and backed with PGI Welsh Beef status and Farm Assured membership. “The initiative has the full backing of Prince Charles, with the logo being based on a watercolour painted by him, and in tune with his support for traditional family farms,” says chairman and procurement officer of the group, Rob Lewis. He farms with his mother, Violet, wife Audrey and their sons Gethin, Rhys and Ieuan, at Glan Elan, an upland beef cattle and sheep holding overlooking the gateway to the Elan Valley reservoir complex known to tourists as the Welsh Lakes, at Cwmdauddwr, on the outskirts of Rhayader, in Powys. Recent years have seen him and the family establishing a rare achievement in winning no less than five supreme and a couple of reserve championships in the keenly contested Royal Welsh Winter Fair carcase competitions. Achieving a quality product is his prime aim and a characteristic he says not only lies among the lambs produced from within the Cambrians but with the cattle as well. As well as his farming activities he is also a part-time lamb buyer for the Randall Parker Food Group at its Llanidloes abattoir, a trustee of the farmer-run Rhayader livestock market and vice-chairman of NFU Cymru’s Brecon and Radnor county branch. His passion for providing a quality product and maintaining traditional family farms is what has spurred him on to set up a locally-based marketing initiative. His parents began farming in 1959 on the tenanted Tynpystyll Farm on the mountain road to Cwmystwyth, with its common grazing rights. They took on the tenancy of Glan Elan in the 1970s and subsequently purchased the farm, along with the neighbouring Newhouse Farm, taking the total area to around 241 hectares (600 acres) of owned and tenanted ground. The cattle enterprise revolves around 50 spring calving Limousin and British Blue cross suckler cows going to a Limousin bull, with all the calves being finished on-farm. Male calves go off as bull beef at 12 to 15 months averaging 400 kg, while the heifers are finished as two-year-olds at 340kg to 400 kg after two summers at grass. “Our sheep farming system is a fairly stratified one made up of some 1,300 ewes, starting with the mountain flock of up to 450 traditional Welsh Mountain hefted ewes at Tynpystill, where the land rises from 750 feet to more than 1,650 feet on the common grazings. “As four to five-year-olds, the ewes are taken in hand and put to South Country Cheviot rams to produce Cheviot-Welsh crossbreds, which go to a Bluefaced Leicester to maintain the 400 Welsh Mules we keep at Glan Elan. “It means as far as the ewes are concerned we are totally self-sufficient, buying in only Welsh, South Country Cheviot and Bluefaced Leicester rams, together with, of course, three-quarter Beltex crossbred tups, which have replaced Suffolk and Texel s to produce our finished lambs. All are sold deadweight. 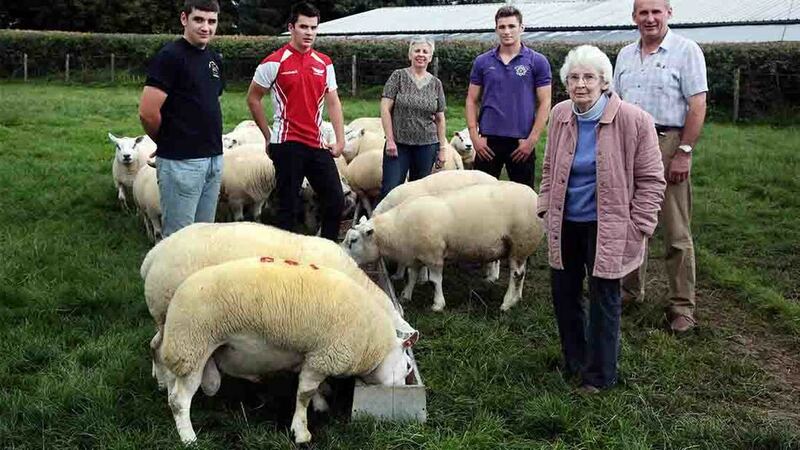 “Our introduction to the Beltex, to a large extent, came from a chance meeting at the Winter Fair with West Wales-based breeders Rob and Sheila Rattray, from New Cross, Aberystwyth. “Over the years we had never really had time to compete with either cattle or sheep and it was largely because of a growing interest from Rhys that we decided to try our hand. “A spur of the moment decision to buy half a dozen three-quarter-bred Beltex cross bred ewe lambs in the Winter Fair ale ring set us on our way and Rob became one of our main sources for our Beltex crossbred rams. “Running a butcher’s shop and meat supply business he has also given us an invaluable insight into what the retail trade -- and most important of all the customer -- wants from meat, whether it be beef or lamb. “We regularly supply him with lambs and heifers, adding further to the recognition of the quality of the beef produced from cattle that thrive on the upland pastures of the Cambrians. “Our first venture into the showring was back in 2009 with a pair of untrimmed lambs and much to our surprise we came third in the class. We entered again in 2010 and this time topped the crossbred section. The following year with another Beltex they won the overall single championship and did it again in 2014, with Rhys finishing in reserve place. Both will be competing again this year. A spin off from the family’s successes with carcases has been an increasing demand for both lamb and beef from local hotels and restaurants – and a key driver leading to the setting up of a dedicated marketing group. “We feel there is a market out there for a dedicated product with excellent eating quality and produced from a traditional upland area. We have set our sights on meeting that demand,” adds Rob. Andrew Evans, Dol-Lys, Llanidloes, Powys, who with his wife, Janet, and son, Richard, farms 222 ha (550 acres) spread across three farms. Their 70 suckler cows include 30 pure Herefords. Vincent and Marion Jones, with sons James and Aneurin, farm 182 ha (450 acres) based on Bryn-yr-hesglwyn Farm to the south-east of Llanidloes. They have 60 pure Salers which are being put to Charolais and Salers bulls. Robert and Fiona Jenkins and son, Edward, farm 526 ha (1,300 acres) at Cilhaul, near Trefeglwys, Powys, running up to 1,200 feet, The 120 suckler cows produce mainly Hereford cross beef. Alun and Aneurin Williams and their father, James, farm around 182 ha (450 acres) at Upper Bwlchillyn Farm, on the eastern slopes of the Cerist Valley, north of Llanidloes. The 65 suckler cows are mostly Angus and Limousin crosses put to Angus or Charolais bulls.